All club members are encouraged to pay membership for this season ASAP. This will allow you to play for the club and enjoy the facilities throughout the current season in addition to basic IRFU insurance. It also means you may be eligible to apply for International tickets when available. Our community based club relies totally on volunteers for the smooth running of rugby in Letterkenny. Letterkenny RFC provides our facilities at no charge for local schools games, LYIT and our teams in Minis, Youths and Senior Rugby. All funds raised by membership and any other fund raisers are committed to developing rugby through the community and keeping our young teams playing both home and away across the playing fields of Ulster and beyond. 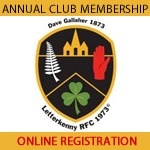 Big weekend for Letterkenny RFC at all levels.  Full Program of senior and youth fixtures at home - minis training.